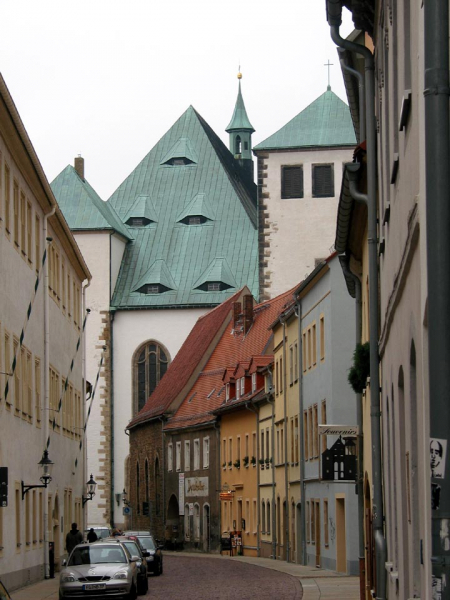 Freiberg in Saxony is an exceptional city as there are four (!) extant Silbermann's organs. 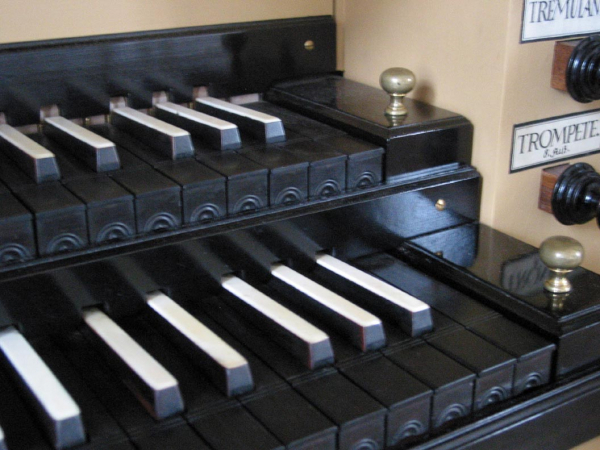 The most famous instrument is the three manual organ in the cathedral. It is a work of Silbermann's youth: he built it when he was 27 years old. The sample set, which we present here, is a model of another Silbermann's opus. 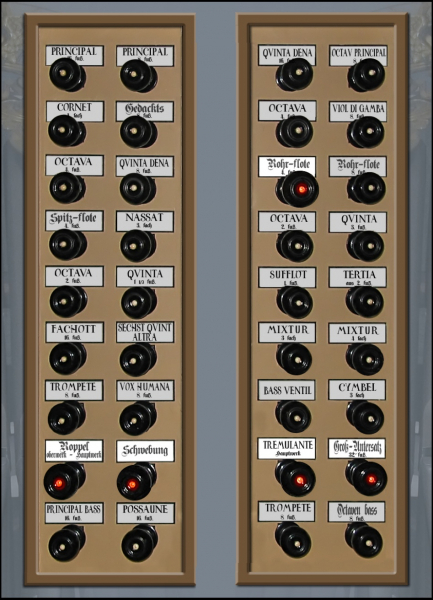 It is the organ in the Petrikirche (St. Peter’s church), a two manual organ with an unusually rich specification of 32 stops. Admittedly less famous than the Cathedral organ nearby, especially now after the reconstruction, the organ is a representation of the mature Silbermann’s craftsmanship of the late Baroque and an acoustic ideal for many interprets and organ lovers. 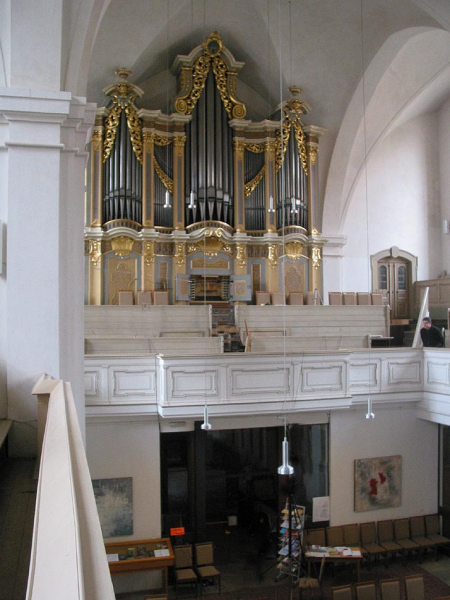 ... whenever I travel to Saxony, it is the organ of the Petrikirche that I faithfully visit. It is here that I have found "the" organ. It is here that I understood, for the first time, the meaning of the famous "Gravität" which young Bach was already asking for in his report on the Mühlhausen organ, back in 1708. 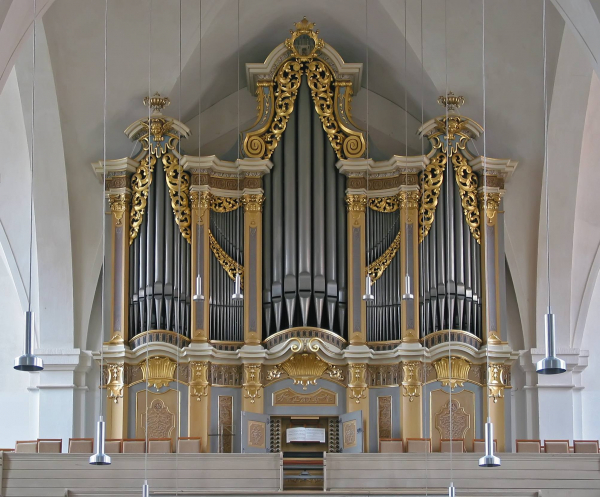 The Petrikirche organ, smaller than its illustrious neighbour (the cathedral organ with 45 stops), sounds nonetheless bigger, for it has a magnificent Principal 16', of unequalled nobility and depth. Another feature of this organ, and not the least, is that it is the only completely preserved witness to Silbermann's last manner. 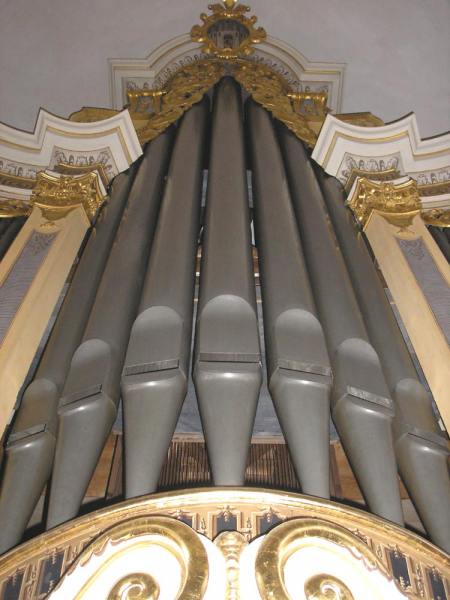 In 1917, the organ was spared of the prospect pipes to be requisitioned for war purposes. The instrument was found heavily infested with a wood beetle in 1935 and the worst damaged parts were replaced (Jehmlich). A new bellows system was installed in 1940 enabling supply of different pressure for the Hauptwerk and Pedal (90 mm water column) and for the rest of the organ (80 mm water column). 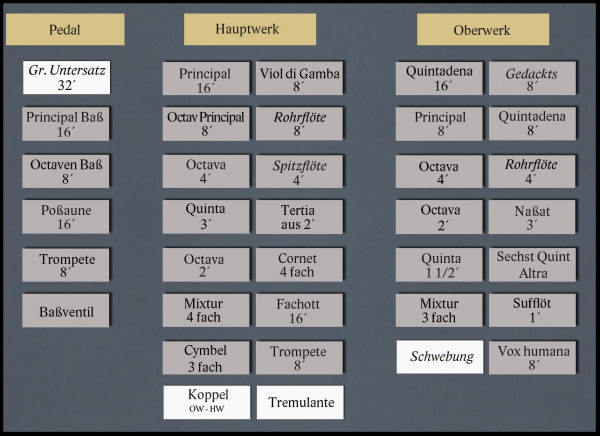 The added manual’s disposition was altered in more Baroque way (Dulzflöte instead of Aeoline, Gedackt 8´ instead of Dolce, Prästant 4´ instead of Violine 8´, Superoctav 2´ instead of Salicet 4´, added Scharf 2fach). Later in 1952, changes were made to increase the wind supply to the pipe work and the wind pressure was decreased to 75mm water column. At that time neo-Baroque organs were appearing. The end of the 50s brought upon a change: the added manual was removed in 1961 and the temperament changed to an unequal one. Horst Jehmlich performed a thorough survey of the instrument in 1975 and outlined historically accurate restoration of the instrument. Lack of finances led to only partial interventions until 1993, like reconstruction of the tracker mechanism, removal of C sharp (still, without returning to the original temperament), removal of the 1896 Subbass 16‘ in Pedal, relocation of Trompete 8‘ to its original place, reconstruction of the manual shift-lever coupler and renovation of the console and register pulls. Since 2004, detailed planning for a general reconstruction respecting return to the original shape from 1735 was under way. 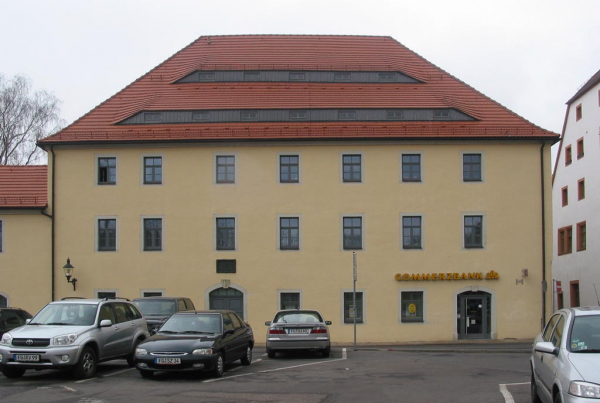 Once financial means were collected, the companies Jehmlich and Wegscheider were approached and they performed the restoration between October 2006 and July 15, 2007 – the day of new consecration. 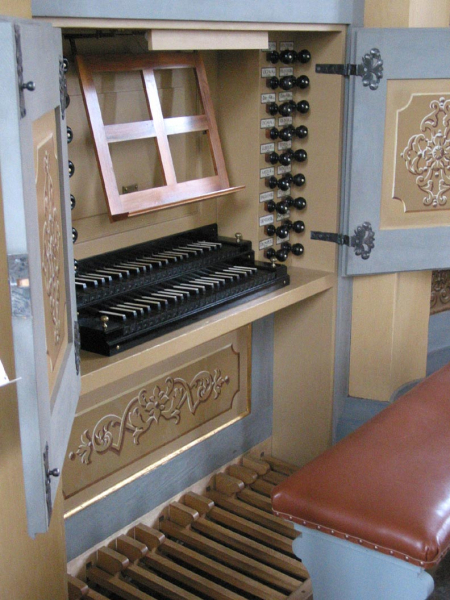 In this way, the Silbermann organ was restored to its original beauty and sounds again in the Petrikirche. Petrikirche (St. Peter’s church) in Freiberg. The history of the church and its musical history. St. Peter’s church dates back to the 12th century. It was built as a three-nave Romanesque basilica on one of the highest elevations of the city, also a place that served as former execution grounds. The church was consecutively modified in the Gothic style due to frequent fires (1225, 1375, 1386, 1471, 1484). For a significant time, the church stood in the center of an affluent merchant district hence there was no scarcity of funds for construction. A large fire in 1728 left only the outside walls and the south tower standing. The church was then rebuilt in a Baroque style and the culmination of the efforts was the acquisition of a new Silbermann organ in 1735. Theodor Quentin substantially changed the interior of the church in 1895-96 who removed the empores and enlarged the site choirs deeper into the church nave, which became narrower. The last pronounced changes were in 1974-83. Walls joined the side empores and the spacious areas behind them serve the needs of the parish. A glass wall separates the sanctuary. Friedrich Presse designed the sculptures adorning the bright white interior. However, the aesthetically interesting reconstruction lacks from the acoustic viewpoint. 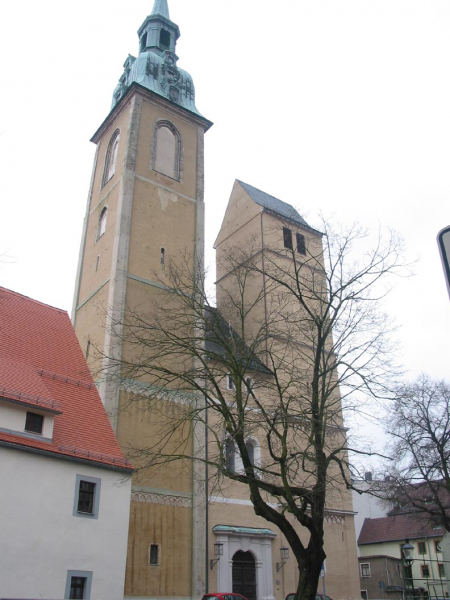 The church’s attractions include a 236-foot (72 m) high Peter’s tower with bells from 1487 and 1570 as well as the two story apartment of the fire watchman who resided there until the beginning of the 20th century. 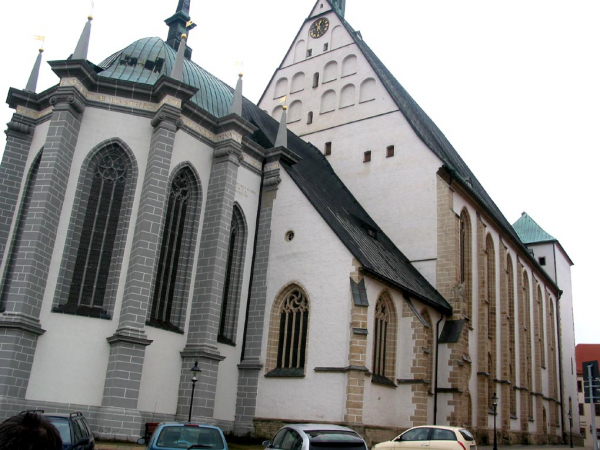 The Lutherans owned the church since 1537, long before a wide spread of reformation in Saxony. The musical life prospered there. Beside the accompaniment of liturgy, figurative music and solo performances flourished. 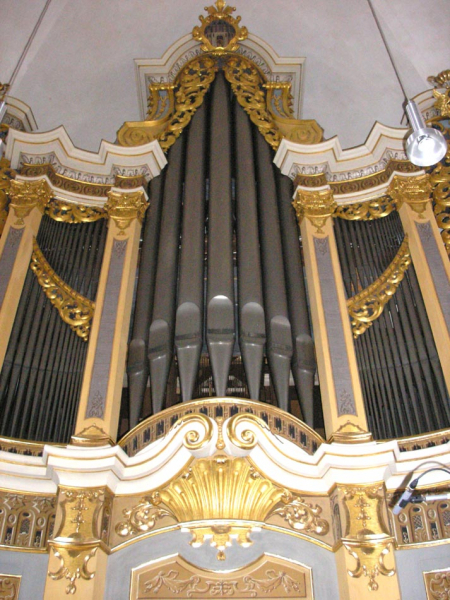 The first organ appeared in the church in the second half of the 16th century. 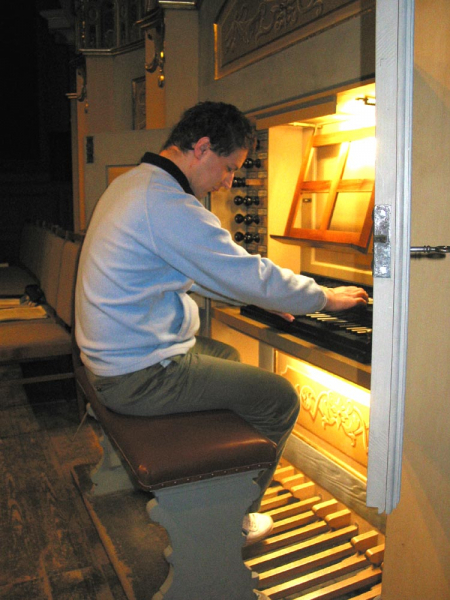 Gottfried Fritz upgraded the organ into a three manual instrument with pedal and many solo voices (Dulcianbass, Bauernflöte). 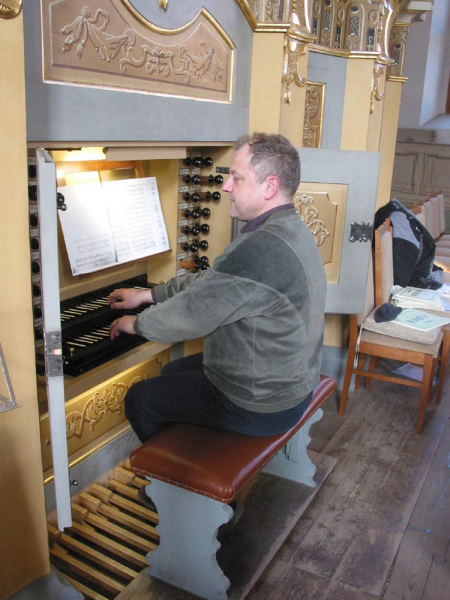 Christoph Schreiber arranged for alterations in 1629 and in this period the organ was the biggest and main one in the town because the Cathedral instrument (originating in 15th century) nearby was in poor shape. Angels playing flutes adorned the prospect of the organ. The Thirty Years' War led to a partial decline and the post of the organist was absent for financial reasons. 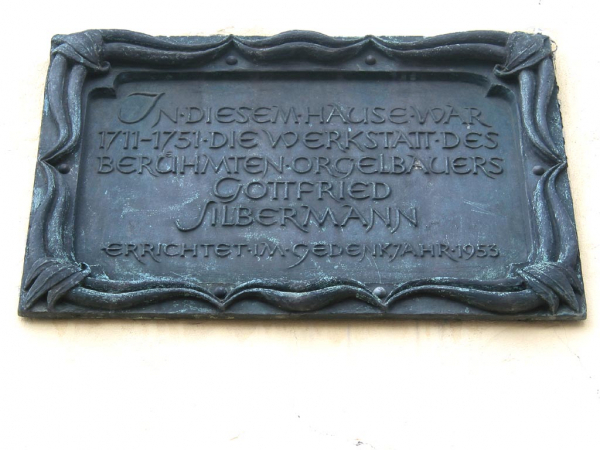 Around that period for some time, the post was given to Andreas Hammerschmidt, the son of Czech emigrants and possibly one of the most played German composers in that era. The last reconstruction of this specific organ was done in 1678 and then another fire destroyed it on May 1st, 1728. But even before that, the musical life was transitioning towards the city cathedral, where Silbermann built an excellent organ in 1714. It was him who was entrusted to build a new instrument for the reconstructed St. Peter’s Church. It was supposed to be the most beautiful and outstanding organ in the city, however the spirit of the actual period and the intellectual development was unsupportive. 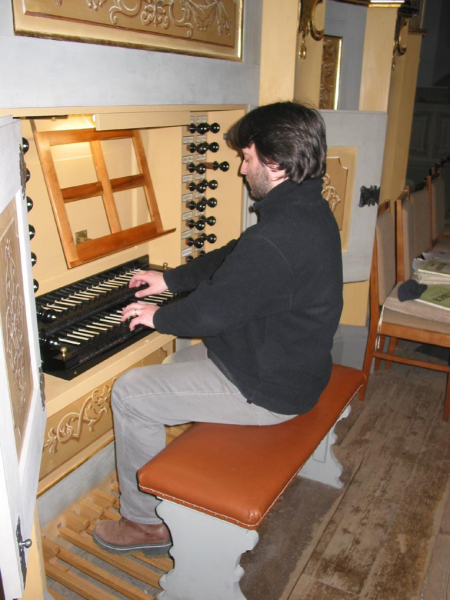 The late Baroque period brought about a slow decline of solo organ performance. The St. Peter’s parish leaders were influenced by Pietism (Christian Friedrich Willisch, among them) and required only supportive musical accompaniment from the organ. Solo performance, figurative and instrumental music was restricted to the minimum. 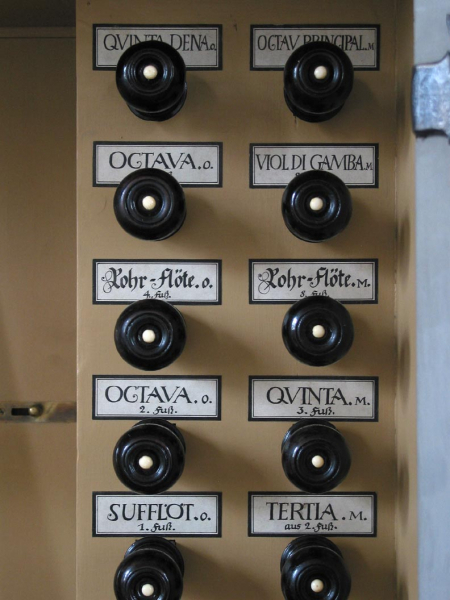 The organist’s post was not well supported and with the death of the last organist in 1761 was abolished. All the more surprising is Silbermann’s approach to the challenge. 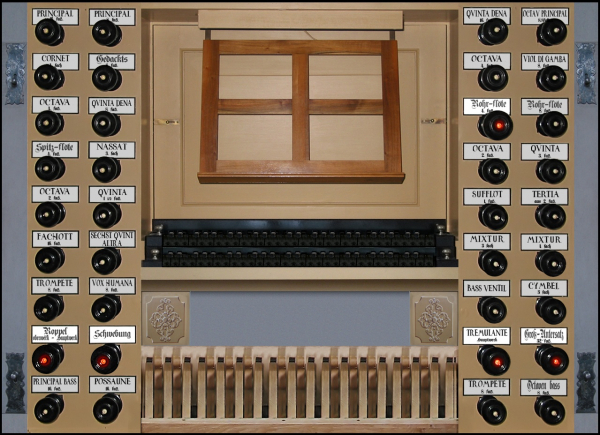 Not only did the newly built organ fulfill the requirements reflecting the change of taste and musical sentiment, but also went above and beyond. 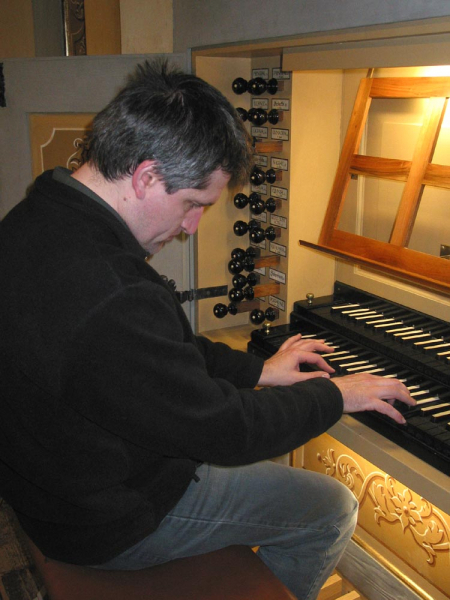 Silbermann built an instrument, which is not only enabling the interpretation of the traditional Baroque repertoire, but at the same time is offering a new acoustic quality, which transcends the Baroque. The organ builder’s intent succeeded - even now, after 270 years, the reconstructed organ sounds in its original beauty during the liturgy, concerts and in frequent recordings. Die Gottfried-Silbermann-Orgel der Petrikirche zu Freiberg. Sandstein Verlag, Dresden, 2007. W. Müller, Auf den Spuren von Gottfried Silbermann, Evang. Verlag, Berlin, ca. 1967. Special thanks to Andreas Hain, the Kantor, for his incredibly warm and kind welcome during the recording. 10 channel recording was done in 96kHz/24 bit, the post processing was done using 32-bit depth. Hauptwerk version 4.1.1 and higher supported for the Organ Definition Files. The resulting samples are offered in 24bit/48kHz quality, multiple releases. Occasional multiple attack samples are used. The reverberation time is up to 4 seconds. The steady sound of the pipes has about 6-8 seconds for the flue pipes, up to 12 seconds for reeds and mixtures. There are multiple loops in the sample (normally 3 sometimes up to 5). Random pipe detuning applied. Two tremulants (Tremulante, Schwebung) modelled at different rates. Dual channel tremulant model proprietary to Sonus Paradisi used for higher fidelity of the tremulant model. The sample set is encrypted, dongle update required, no use outside Hauptwerk possible. The original compass of the manuals is 4 octaves without the lowest C# (this tone was added virtually in our model). The original pedal compass is 2 octaves without the lowest C# (also added virtually). In the virtual model, we extended the compass of the manuals to 4.5 octaves (up to f) and also the pedal compass was extended to 2.5 octaves (up to f). 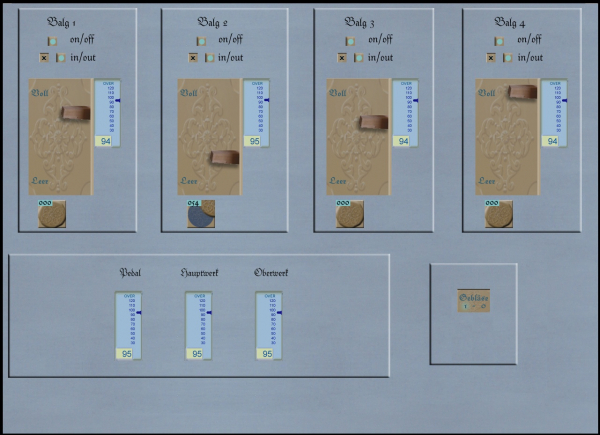 New in version 2.5: the extended compass works also with the Original Organ Temperament. Surround: [new in version 2.5:] the surround recording uses 6 independent channels for each virtual pipe (for each sample). There are four front channels (2x direct, 2x diffuse freely mixable using the mixing console inside Hauptwerk), two rear channels. At least four speakers are needed to reproduce the surround audio: two front speakers and two rear speakers. All four front channels should go to the two front speakers, the two rear channels should be routed to the rear speakers. Using the mixer sliders, the user can move towards or away from the organ. The diffuse position of the mixer is far from the instrument, the direct position of the mixer is close to the organ. 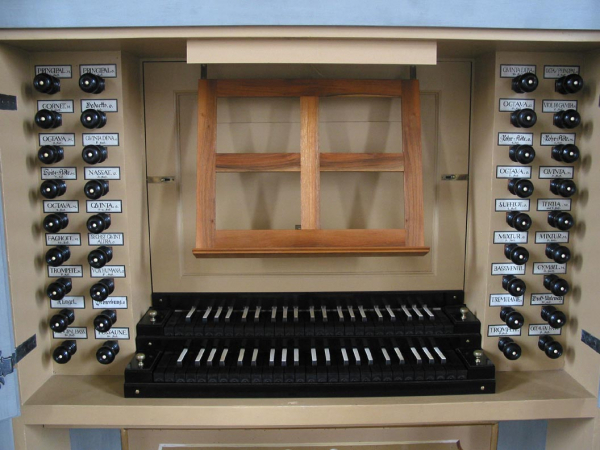 The mixer settings can be stored and retrieved each time the organ is loaded. For the surround sound, it is necessary to route the virtual front and rear "ranks" into the corresponding audio outputs. Using the same dialog, the rear ranks can be completely muted, resulting in the loading of the sample set in the conventional wet (simple stereo) setting. Dry: the samples offer the close-uprecorded sound of individual pipes. 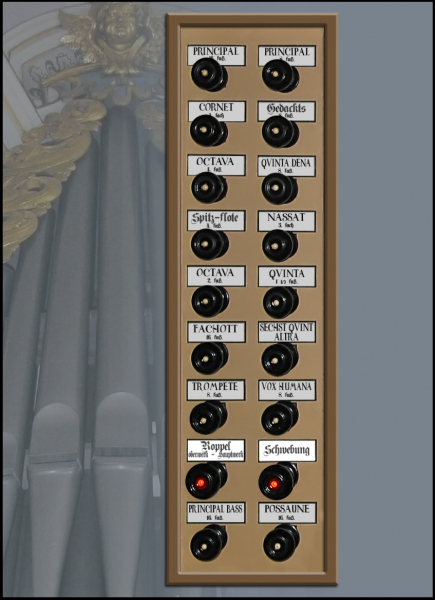 This variant of the sample set may be used in self-reverberant spaces (such as churches) or it may be mixed with the digital reverb. 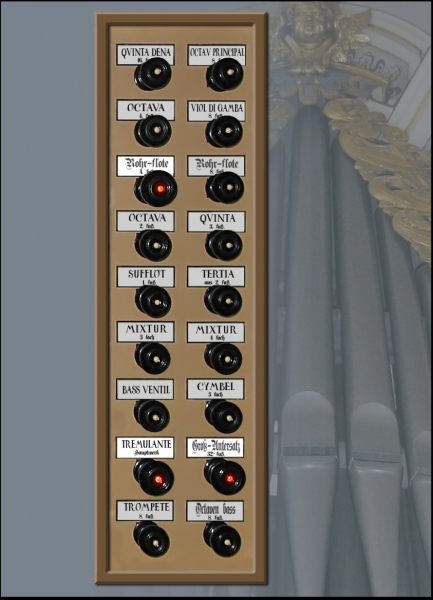 By the addition of digital reverb you can virtually "move" the organ into various spaces according to your need and your liking. The organ is tuned in Chorton, about 70 cents above the "normal" a. When recorded, its heigth was a=458.1 Hz. 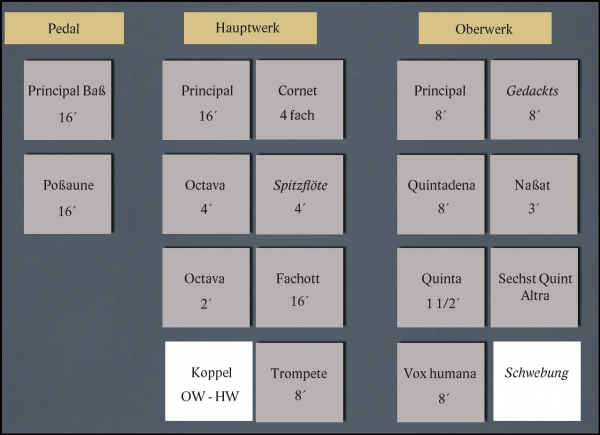 In addition, we offer three more temperament charts with the sample sets, all of which are modified meantone temperaments as found during the course of history on the other Silbermann instrument, the great organ of the Freiberg Cathedral. These are the Silbermann-Sorge temperament, modified Silbermann temperament of 1982 and another modification of this temperament known as "Freiberg 1985". 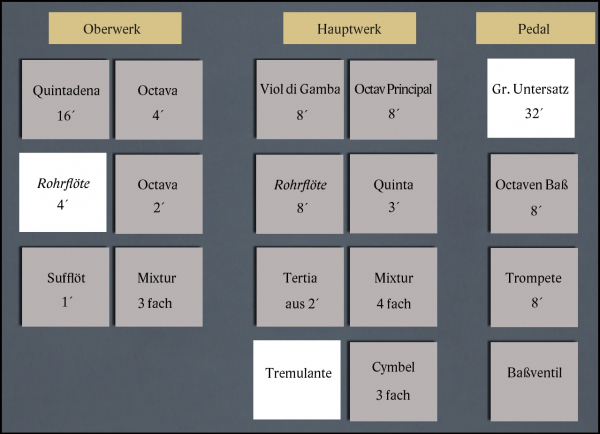 These temperaments are described in detail in the book Christoph Schwarzenberg - Kristian Wegscheider: Die grosse Silbermann-Orgel im Dom zu Freiberg, p. A5-A7. All the temperament charts may be optionally installed together with the sample set. Version 2.5 is now in the distribution. No updates. - Tremulant model. Samples were newly processed using the Dual Channel Tremulant technique to allow for convincing artificial tremulant behavior. - Portrait screen orientation supported for the Left and the Right stop jambs. New Portrait jambs added. - 6 channel surround, the front channels are either direct (near) or diffuse (distant). 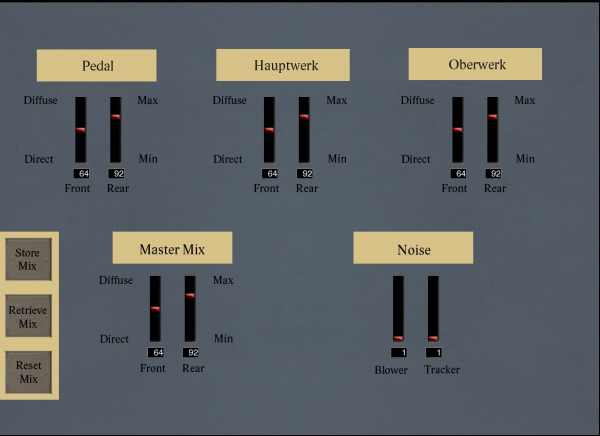 User can freely mix these two listening positions using the built-in mixing console. - stereo samples for the dry variant. - add an automatic mixer settings retrieve functionality after the organ is loaded.